Suited connectors are probably the hardest hands to play in Texas Hold’em. We’re talking about hands such as 56 suited or 78 suited, i.e. hands that do have a potential to flop really big. But, more often than not, we end up with a mediocre hand. So, in the long run, these hands can be quite costly. Yet they can be so hard to fold, especially in cash games, where we’re usually playing deeper stacks. So, to try and help you improve your game, we’re bringing you a few useful suited connector tips, which should make things easier in the long run. While these tips may not answer every single question and address every single situation. They should make it easier to create a better overall plan for your game. With hands like suited connectors, you need to be very picky about situations you get involved in. Preferably, try to get involved in the pots where you’ll have position on the flop and on the later streets. This will put you in situations where you’ll be able to make more money when you actually do flop monsters. Also lose less when you end up with a mediocre hand like a middle pair, no kicker. Suite connectors are powerful exactly because they can make huge hands that are often well-disguised. These hands play very well in multi-way pots. You’ll also be more likely to actually make some money in pots with more players involved. In your overall game-plan for suited connectors, you should look to play more multi-way pots instead of playing them heads up. Although you’ll be more likely to win a heads up pot when you hit a mediocre hand, these won’t be big pots. It is not really the scenario you’re looking for when you get involved with 56 of hearts. 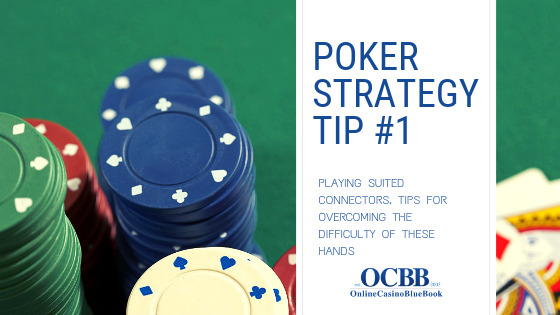 Like with everything else in this game, your poker strategy with suited connectors needs to be more dimensional. What this means is that you can’t afford to always play them the same way. Especially if you’re up against solid players who’ll pick up on what you’re doing. And those who will be able to define your range based on your preflop actions. So, although you’ll usually just call on the button with suited connectors facing a raise and a call in between, you should consider putting in a 3-bet some percentage of the time. This will help balance your range and keep your opponents guessing because you’ll also do this with your strongest hands. The additional value of this play is that when you do flop a monster, other players will have hard time putting you on it because of your preflop actions. Although the idea of getting involved with suited connectors is often so appealing. One thing you should definitely avoid is cold calling. For example, if there is a raise and 3-bet in front of you, even if you have a position, you should almost always fold your hand in this spot. There may be certain table dynamics where calling could be justified but, in general, these are quite rare. There are multiple problems with calling in this spot. First of all, you’re not closing the action so the original raiser could still 4-bet, putting you in a really awkward spot. Furthermore, even if you do see the flop, it will be really hard to define your opponent’s ranges and navigate things after the flop. So, you should avoid these spots at all costs. As it is almost impossible to come out ahead even against bad players, let alone decent ones.